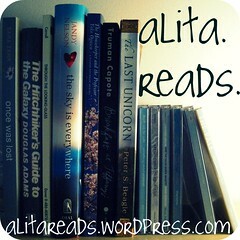 Teaser Tuesday (09.15.09) | alita.reads. Teaser Tuesdays is a weekly event hosted by MizB at Should Be Reading. It’s easy enough to play along, just follow the Teaser Tuesdays link for rules. This week’s quote comes to you from The Historian by Elizabeth Kostova. Ah, so true! Hungarian sounds like nothing else. I was able to learn a few phrases, but for some reason I can only remember how to say “I am a banana” and “just kidding.” Obviously my brain knows how to remember the important things. wonderful teaser. If you want to wander down my road I’m home. Great Teasers! LOVE the second one it’s too funny! It’s also super funny you only remember “I am a Banana” and “Just Kidding” ha, ha, that made me laugh, too! Great teaser..sounds like a good read.thanks for visiting me. Well, I guess my question is, how DO you say “I am a banana” in Hungarian? I mean, that’s pretty random. :) I have some of the weirdest phrases memorized in other languages, too. great teaser! I’ve read The Historian, and it’s not my kind of book it had a lot of potential, but then it died on me. Hope you will enjoy it more than I did. Are you liking the book? I tried to read it a few years back now, but found it dull and never got past half way. Maybe I should try it again! Haha, useful phrases to remember! Absolutely love this book! And you picked some great parts to pull out! Can’t wait to see your review on this! Sounds like a very interesting book. I’ll have to look into this one. Zia – I’m glad to hear you liked it! Natalie – Haha. It’s a great visual for how the language sounds! Jennifer – It’s a great book, you really do need to pick it up! Krista – I learned some useful phrases too (really, I did! ), but my brain obviously thought they were too boring to remember. sumanam – It is good, I highly recommend it! Karoline – It’s not my usual kind of book either, in that it is sooo long! But the story keeps pulling me along. I’m at about the halfway mark now, so hopefully it continues to do that. Lisa – I am liking it! It is pretty dry, and long, and but I am enjoying the story. heyannahey – Next week might be an epic battle of Historian quotes! I’m sure I’ll still be reading it next Tuesday, so I’ll bust out some more Historian goodness. Good thing there are lots of good ones in there! Jacqueline C. – It’s a great, moody, creepy book! Good teases. I can’t wait to start reading (or should I say re-reading since I picked it up years ago but only got about 100 pages in at the time). Looking forward to your thoughts on it. I’ve been looking at this one, for quite some time now. Oooh, shall I? Shan’t I? I’ve been teased, that’s for sure! Hahaha, your Hungarian sounds like my Mandarin – at this point I can pretty much say “I have no hair”, “big red watermelon”, “swimming pool”, and “be careful”. I feel like “be careful” is my best bet for being useful, but I have so far never been around a Chinese person in danger! It’s all Greek to me . . . Thanks for hopping by my teaser. It would be more meaningful to read the original P & P before taking on these other Austen-like books. After you read the originals, plan on reading The Lost Memoirs of Jane Austen — read it recently and loved it. So, I have been wanting to read The Historian for ages now. I bought it at least a year ago and for some reason have never started it. Great teaser, I’ll really have to give it a try! Tam – I hope your second attempt is more successful! It’s weird, when I’m reading, it’s hard to put the book down. But once I’ve stopped, it can be hard to pick it up again. Jenny – Lol! You never know when you might need a swimming pool, or a big red watermelon for that matter. Kim – Thanks for the suggestion! I’ll add The Lost Memoirs to my to-read list. Lizzy – Ack, is it every big! It’s taking me longer than I’d like, but I really like the story. the seventh l – You should read it! The story is great, and the descriptions so vivid! I read the Historian several years ago and really enjoyed it. It started out a little slow but I kept with it and was glad I did. Hope you are having fun with it. I love the teasers. The Historian sounds like one I might like to read. Great teaser!! This one is waiting for me. I cannot wait! Good teaser, not something I’d want to read but a good teaser none the less!